Teddy Roosevelt was a fearless friend of nature. Mark Twain called him " the Tom Sawyer of the political world of the twentieth century." There had never been a President like him. He was only forty-two years old when his predecessor William McKinley was assassinated, the youngest age ever for the chief executive. He was graduated with the highest honors from Harvard, wrote 23 books, and was considered the world's foremost authority on North American wildlife. He was a prizefighting championship finalist, leader of the Rough Riders, a cowboy, a socialite, a police commissioner, a governor, and a Vice-President. All this was accomplished before he entered the White House. His energy was contagious, and the whole country was electrified by their new leader. Roosevelt was born in 1858 to a wealthy New York banker and the daughter of a prosperous Georgia planter. He was anything but the model physical specimen. His eyesight was poor. He wore thick glasses his entire life. As a child he was small and weak. He suffered from acute asthma, which contributed to his frailty. Taking his father's advice, he dedicated himself to physical fitness, without which he believed there could be no mental fitness. His hard work paid off, and as he entered Harvard with a muscular frame, his condition bothered him less and less. Soon he met Alice Hathaway Lee. Although he believed her to be the most unobtainable woman around, he was determined to marry her. Again, he was successful, but his life with Alice was short-lived. In 1884, four years after his graduation, Alice delivered a daughter. Owing to complications, she died in childbirth on the very same day as the death of his mother. Assistant Secretary to the Navy. 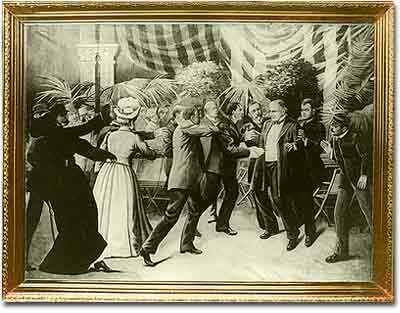 Theodore Roosevelt's much-heralded charge up Cuba's San-Juan Hill made him into a national hero. When the Spanish-American War erupted, he helped form a volunteer regiment called the Rough Riders. His success in the war led to the governor's office and then the Vice-Presidency. Up to this point, the Vice-President had little power, and few had gone on to the White House unless a tragedy befell the President. 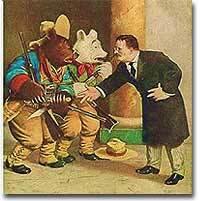 Many Republican leaders supported Roosevelt in the number-two job for this very reason. They feared his headstrong style and maverick attitude. 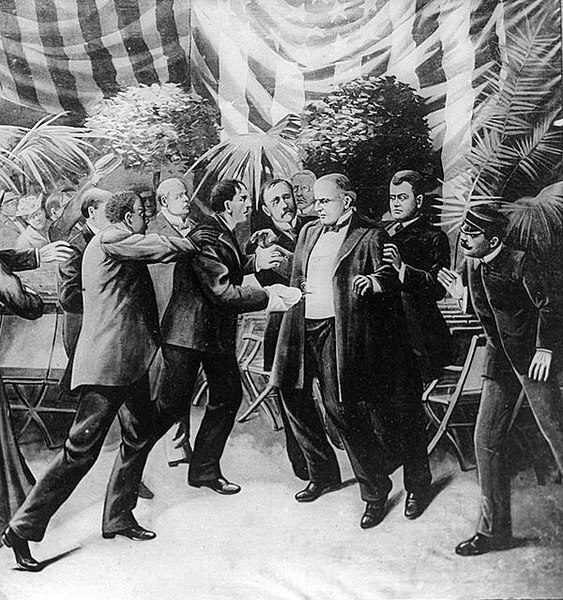 Their greatest fears were realized when a bullet ended President McKinley's life on September 13, 1901. Soon it was clear that a new type of President was in town. The Presidency had been dormant since Lincoln's time. Congress seemed to be running the government, and big business seemed to be running Congress. Philosophically, Roosevelt was outraged by these realities. Although he himself hailed from the wealthy classes, he strongly believed that no individual, no matter how rich and powerful, should control the people's representatives. Furthermore, Roosevelt was convinced that if abuse of workers continued to go unchecked, a violent revolution would sweep the nation. An outspoken foe of socialism, Roosevelt believed that capitalism would be preserved with a little restraint and common sense. Within months he began to wield his newfound power. Roosevelt changed the office in other important ways. He never went anywhere without his photographer. He wanted Americans to see a rough and tumble leader who was unafraid to get his hands dirty. He became the first President to travel out of the country while in office and the first to win the Nobel Prize. Unlike his quieter predecessors, Roosevelt knew that if the Washington politicians resisted change, he would have to take his case to the people directly. He traveled often and spoke with confidence and enthusiasm. Americans received him warmly. The country was thirsting for leadership and Roosevelt became a political and popular hero. Merchandise was sold in his likeness, paintings and lithographs created in his honor, and even a film was produced portraying him as a fairy-tale hero. The White House was finally back in business. You can be there! 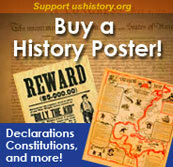 The Library of Congress has 28 films documenting the final days of the McKinley administration. Clips of some of them, including McKinley's funeral procession, can be viewed and/or downloaded by following links on this wepage. Don't miss it! This story about the original "Teddy Bear" was written for children, but everyone can enjoy reading about how an actual event received great political spin, created an endearing national symbol and launched a new industry. Illustrated. This nicely illustrated page from the PBS American Experience series on U.S. Presidents, looks at Theodore Roosevelt's life up until his entry into politics in the New York Assembly. Links to 2 speeches from that time period. Theodore Roosevelt National Park is a living memorial to the 26th President of the United States. It honors his enduring contribution to the conservation of his nation's resources. 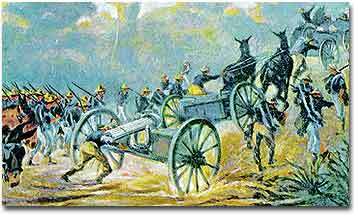 Theodore Roosevelt gave up a safe office job as Assistant Secretary of the Navy to do lead the Rough Riders up San Juan Hill. Read here how the heroics paid off.